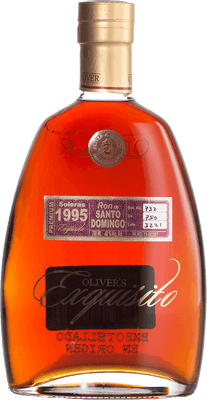 Have you found an online vendor selling Oliver's Exquisito 1995 Vintage Solera? Très bonne découverte, rhum agréable en nez et en bouche. Excellently crafted and balanced to a T. A great blend of dry fruit, some tropical spice and a sweet overtone to finish. One of the sweeter rums from DR, and I often go more for dryer finishes but this is just a sparkling example of great rum. It is a touch spendy but an absolute treat. velké očekávání jsem měl u tohoto rumu. Vůně velmi hřejivá a lehce ostrá - nutné nechat nadechnout. Následně se uvolní velmi jemná vůně , sladká chuť po čokoládě. 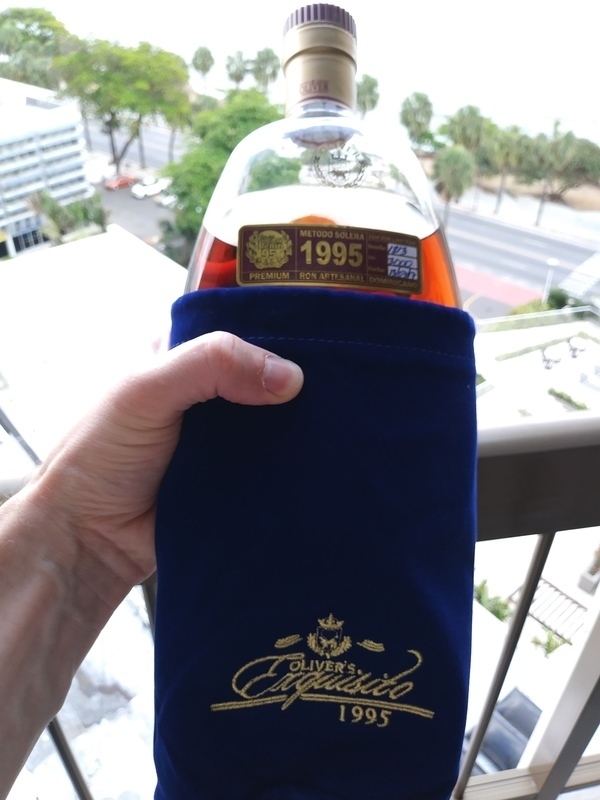 Enjoyed a bottle of Exquisito 1995 in Santo Domingo. Nice bottle design. Numbered bottle. Very nice velvet pouch. Dark brown color. Rather sweet to the nose. Quite a kick to the palate which is quickly subdued due to large amount of sugar. Semi long afterburn. I rated the more expensive 1985 an 8 since it was much stronger in both flavor, sweetness and burn. The 1995 deserves a 9. Beautiful dark color, very nice taste and a good balance between sweetness and a good burn. Maybe a bit too sweet. Cui îi place chestia marțipanul probabil va fi plăcut surprins de acest rom. Mie, din păcate, nu mi-a plăcut.. In conparsion with another Exquisito rums this is lower complexity and smaller body than other big rums. It is quite nice. Better than average. Quality from Oliver. Caramel and coffee are strong with a hint of chocolate. Not too strong with oil hanging on. Nt sweet not dry, but with lower complexity and smaller body than other big rums. Shrnutí:	Ochutnal jsem v Pivnici U Čolka v Brně-Žabovřeskách, kde mají velmi pěknou rumovou nabídku, odhadem asi 150-170 druhů. Pro mě nejlepší ze sedmi zde ochutnaných rumů. Což je na nejlevnější a nejmladší rum z řady Oliver's Exquisito slibný výsledek. Nice rum to drink, not to sweet, not to dry, nice aftertaste. One of the best rums I have drunk. It is a little bit too sweet but very soft taste. If you like very mild and soft rum like Plantation Aniversary XO but with more woody sweetness then this is the rum you should try. If you drink regularly then it may become too sweet for you but occassionaky It is fine. Good sweet rum but it doesn't taste of that much.. I really liked this one. It is somewhere between 8-9/10 for me. You can taste the vanilla, the nosing is perfect. In the taste it is not so sweet (that I prefer) but its smooth in the throat. This is a very smooth rum. Has a nice "edge" to it. Not too sweet and a long good aftertaste. This Rum is very close to the Ron Esclavo 15 year product also produced by Oliver & Oliver! it is not bad Rum, let it brief for around 10-15 minutes and it will taste even more.